Kookabuk has a prized green shovel, and he can't stand sharing it. When Emily wants to borrow it, he has a meltdown. 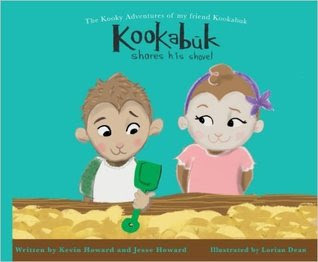 In this social story, Kookabuk learns to share his shovel with Emily and enjoy playing with her. The art is wonderful to look at, and the modeling done by Kookabuk's mother (as well as the explanations in the book itself) will make this a very useful book. It teaches young children how to take turns and share, without necessarily naming it as a dysfunction for autistic children. At the same time, the authors' knowledge of autism spectrum disorders shines here and helps to make this a very approachable means to interact with neuro-atypical children of any kind. All children would find this a great book on sharing, and my children thought it was fun and begged me to read it repeatedly. The means of explaining things is also very useful to use in general, another benefit to having this book in your library.